Pilkington Marine is constantly developing new products for its customers. In addition to its hands-on experience of ship glazing, Pilkington Marine is at the leading edge of product development, able to draw on the extensive technical resources of our parent company, Pilkington Group Limited. This enables us to provide our customers a wide variety of high quality products for their luxury cruise ships. 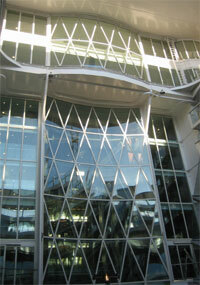 Pilkington Marine also designs and manufactures unique glass products to meet specific customer needs. Whether the requirement is to outline extra lightweight balcony modules or to design a unique opening glass dancefloor over a swimming pool, Pilkington Marine always aims to give customers a full service. Pilkington Marine uses toughened glass to give constructions high strength. Strength is further improved when lamination is added to provide security, producing glass products well suited to the marine environment. The addition of special coloured interlayers enables us to offer distinctive products for specialist applications.